The early nineties brought the onset of the fashionable Goldhead as a must-have fly dressing accessory. I thought I would mark the fact by introducing a new damsel pattern nymph, which also offered various triggers necessary in a successful pattern, which this quickly became. To imitate a damsel nymph, the total length should be approx 25mm (one inch), have a tapered segmented body, a wiggling action, some weight, the ability to dive and rise and also be green! This fly has been responsible for catching thousands of trout for anglers at Albury Estates in Surrey and beyond. It is always worth spending some time practising tying new knots before you have to tie them under pressure beside the water. Tail : Pinch of marabou fibres,with the addition of some olive crystal hair. Body:Olive magic glass,wound over pearl lurex size 11. For a Mayfly version, tie in white marabou for the tail, magic glass is white, crystal hair is pearl and the hackle is brown, otherwise the same. For Bloodworm variant tie in Red. 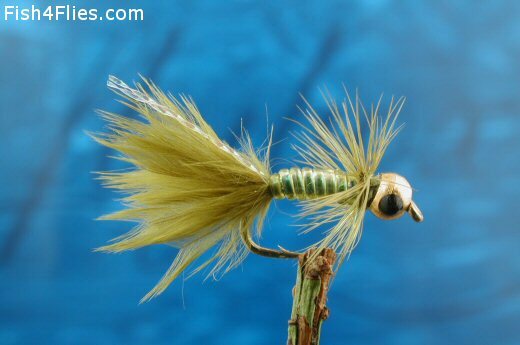 Currently there are no comments about the Goldhead Damsel Nymph fly pattern from other fly fishermen yet.